"Waiting on Wednesday" is a weekly meme hosted by Breaking the Spine that spotlights upcoming releases that we're eagerly anticipating. 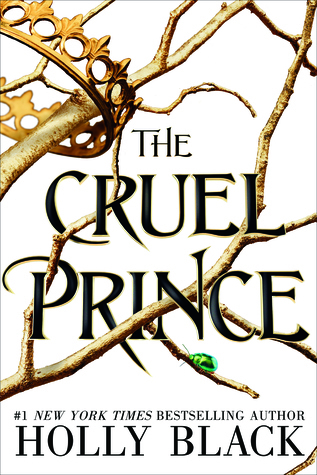 This week on WoW is The Cruel Prince by Holly Black. Although, Holy Black has already been published several times, I have not ready yet any of her books - any recommendation? Which books/series should I read first? Well, I could not resist the synopsis of this book (hopefully, there will not be an abusive relationship) since faeries will always be some of my favourite magical/folk creatures (if you haven't read Wicked Lovely by Melissa Marr, I truly recommend you). The book will be released on January 2nd 2018. "Of course I want to be like them. They’re beautiful as blades forged in some divine fire. They will live forever. In doing so, she becomes embroiled in palace intrigues and deceptions, discovering her own capacity for bloodshed. But as civil war threatens to drown the Courts of Faerie in violence, Jude will need to risk her life in a dangerous alliance to save her sisters, and Faerie itself." I also keep seeing her name pop up - which makes me want to read her novels more and more. Oh I'm excited for this one myself! I hope we both enjoy it! Lots of people are excited for this. Hope you love it! This one of my most anticipated for 2018! I love Holly Black's writing style, and this sounds amazing! My co-blogger is a big Holly Black fan (I think a few of the WLABBers are). I have yet to read one of her books, but I have several. This sounds like it will be quite the epic fantasy! This one is another for which blogger love just grows and grows -- I can't wait to read the reviews! I haven't read any of Holly Black's books either, but I have heard good things about her work. I can see why you want ot read this one. It does sound good! I'm so desperately waiting for this book too! The premise sounds AHMAZING!!! Ooh great pick! I also haven't read anything by Holly Black, and don't know where to start. I hope you love this one! The Nerdy Corner. Funko Pop Addiction!